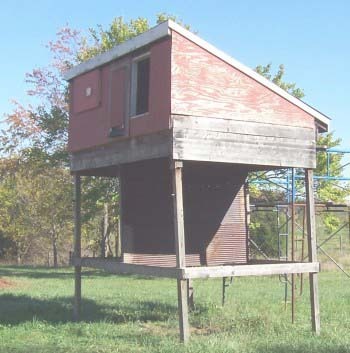 This fall, I have built a new free-standing shelter, only 4' wide, with a row of nests placed along each side between ceiling joists on 24" centers. 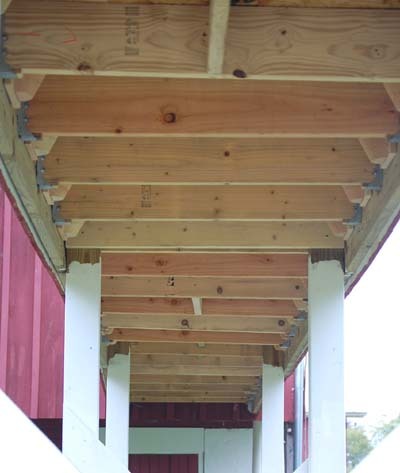 The shelter has a ceiling and well ventilated attic area under a metal roof. The pairs of nest cups in line of sight of each other are approximately 44" apart. In several locations, a divider is provided midway between a nest pair, obstructing the view of the opposite nest. This results in a 2' square cubicle that may be too confining for the swallow's liking. Next spring, when the swallows return, their settlement pattern will determine whether I remove these several dividers or add more. Temperature was monitored in the new shelter to determine the effectiveness of the ventilated attic. On the hottest sunny day after the shelter was completed, the ambient temperature was 92 degrees F. while the temperature in a nest cup was 95 degrees and in the attic 102 degrees. These temperatures were recorded with min/max thermometers, so I'm not sure the three readings were in the same hour. Also, the sun wasn't as high as it will be in early summer. But, I'm still happy with the 7 degree difference between nest and attic and the relatively low attic temperature of 102. 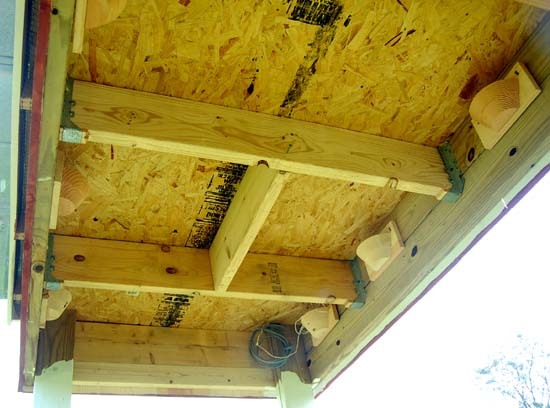 On a similar sunny 92 degree day, it is common for attics to reach 115-120 degrees. barn and enter the house chimneys, just as the big brown bats begin to emerge from under the barn eaves. The bats most frequently spend the day directly over the swallow room, but in the hottest weather switch to the upstairs porch of our house, behind a shutter. Several times this summer, I've counted 48 bats leaving the nursery. 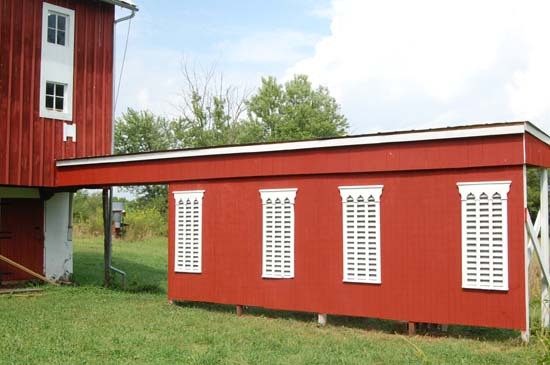 There are always several lone males either on the opposite side of the barn or on the upstairs porch. As the bats begin leaving the roost, one every few seconds, they fly straight to the creek, as if on a mission of great importance. To me, their flight seems quite laborious, but also, wonderfully strange. If I were to fly, I would want feathers. To round out the evening, just before it is too dark to see, and the bats are still filtering out of their roost, one or both of the barn owls appear. Or, if late in the season, nestling owls pop out of their box onto the perch and begin calling for food. Now the show is over for those of us lacking night vision, but, it is always a 20 minutes well spent. Another important consideration in locating the swallow shelter is the proximity to the garden. While we think of swallows as being solely aerial insectivores, I have often watched one perched on a tomato cage and dropping to the ground for an insect, much like other song birds. Also I observed a pair come to the garden several times one day this spring to apparently gather dirt. The ground was dry. The male perched on a tomato cage and watched as the female dug in the dirt. They then both flew off to the swallow room and returned to repeat this several times. This was at a time when several mud nests were under construction. The female would also gather blades of grass from the garden mulch. And, tomato cages and other garden perches are even more important to bluebirds. 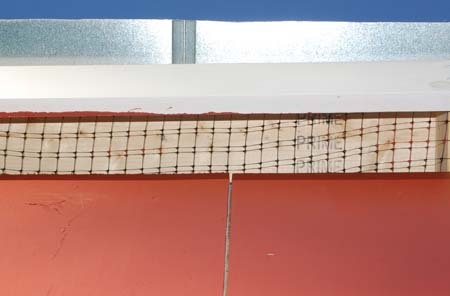 Bird netting under the open eaves excludes house sparrows and starlings from nesting in the shelter attic. 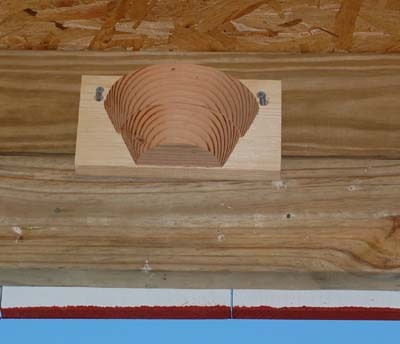 The nest cups are hung loosely from two keyholes, allowing easy removal for nest photography and inspection. The nesting material can be removed between broods if a heavy mite infestation is encountered. 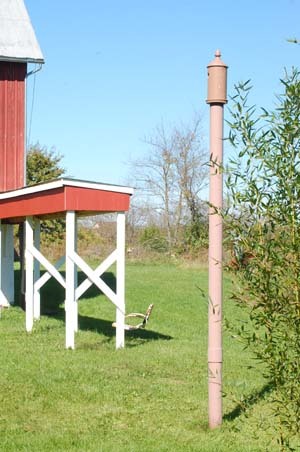 This kestrel box has been closed since 2001 due to its proximity to the barn swallow colony. It is now even closer to the new shelter. The Kestrels have prospered in their new tower since 2002 and a second kestrel pair nested in a flicker box on the barn wall in 2010, well away from the swallow entrance, but on a wall more inline with the new shelter. 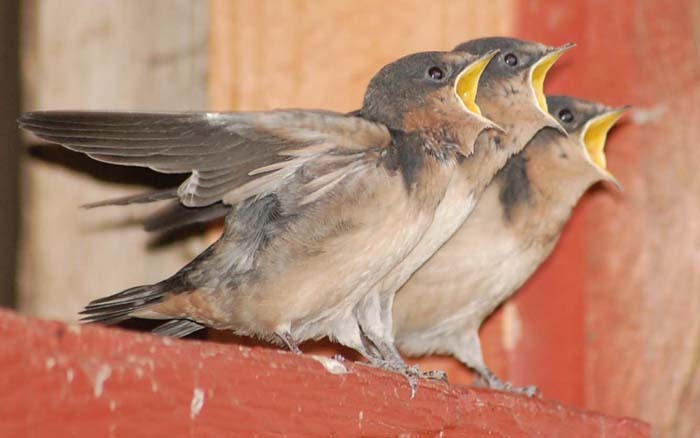 April 1 – The barn swallow colony room is closed to encourage nesting this year in the new shelter. 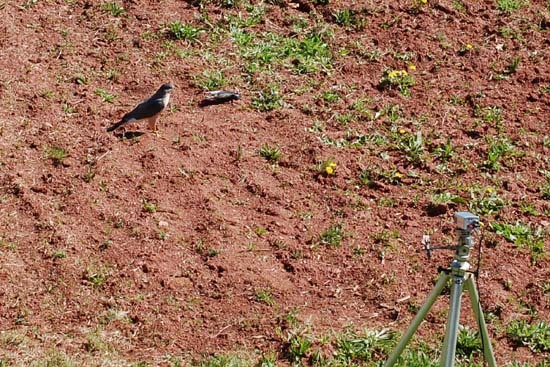 April 10 – The first two swallows arrive. This is a bit late for the usual first arrivals. 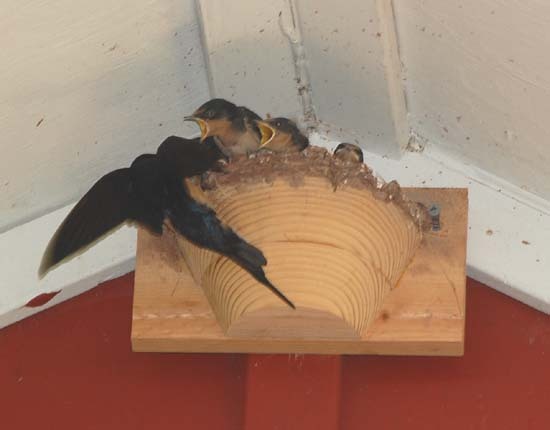 April 18 – Eight swallows have now arrived and frequently fly toward the closed door of their old colony room. They are also flying under the new shelter and frequently landing on nest cups. 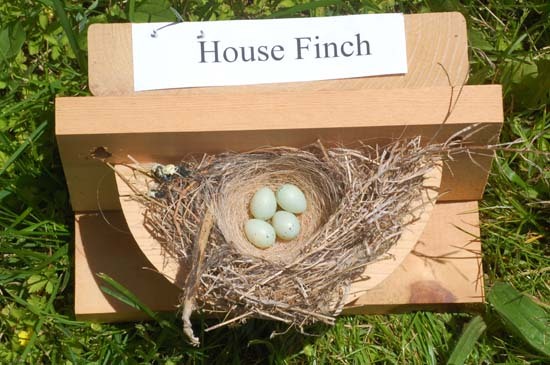 House finches have nested in the shelter in nest cup No. 18, at the far end of the structure. Their first egg was laid today. 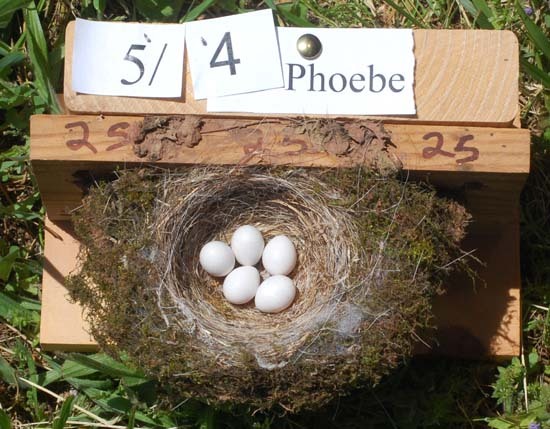 April 21 – Phoebes are nesting in the shelter in nest cup No. 36 at the end of the shelter attached to the barn. Their first egg was laid today. April 26 – This is the first day the swallows were seriously competing for nest cups in the shelter. There still seem to be only 8 swallows, although I can’t be sure I’am always seeing the same 8 birds. But, usually they tend to stay together. 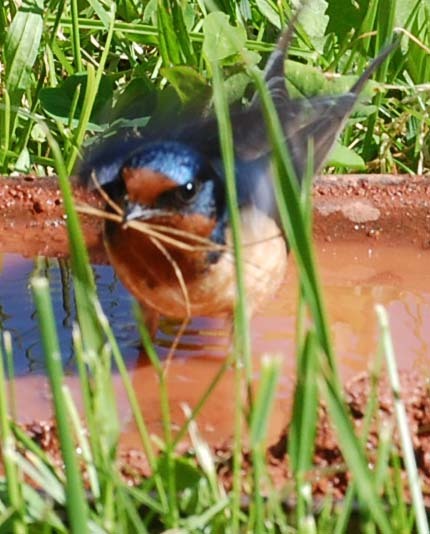 May 5 – Swallows are building mud dams on several nest cups and frequenting a small mud tray provided under the shelter. A tray of ground oyster shells is also provided on one of the shelter posts. 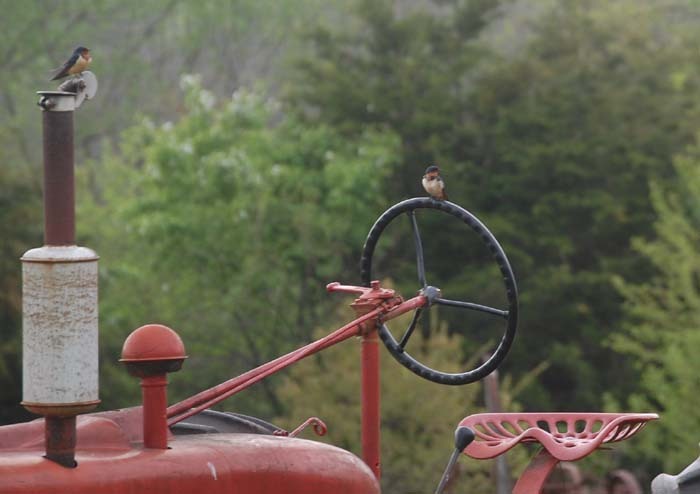 May 17 – A pair of swallows seem determined to nest under the peak of the gable end of the wagon shed. Since the smooth surface would not allow a nest to adhere, I begrudgingly provided a nest cup. The swallows quickly began building a mud dam on the cup. 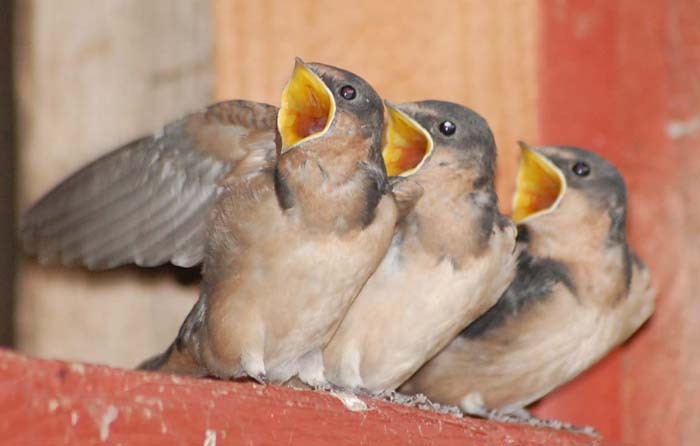 May 22 – Swallows seldom visit the barnyard. One pair is using nest cup No. 21 as a night roost, and perhaps more. I’am staying away from the barnyard, not wanting to interfere with their settling at the new site. May 24 – Mud dams have been added to four adjacent nest cups at the far end of the shelter (No’s 20, 21, 22, and 23). Also, some mud and grass have been added to several other nest cups near the middle of the shelter. More pairs may be using the cups for night roosts. I can’t approach to check in the evening for fear of scaring them off the nest. 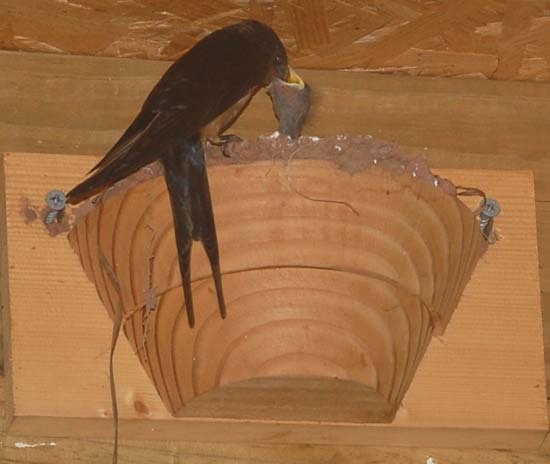 May 27 – The first swallow eggs have been laid in both nest cups No. 20 and 23. May 30 – The first egg has been laid in nest cup No. 21. There are still only 2 eggs each in No 20 and 23. June 4 – There are 5 eggs in No. 20. The last three were laid daily beginning 5 days after the second egg was laid. There are still only 2 eggs each in nest cups 21 and 23. It appears that incubation at all three nests has been infrequent. I suspect that both adults may not be present at nests 21 and 23, each with only two older eggs. Nest cup 20, with the three fresh eggs in addition to the original two has both adults present. June 8 – Today I gave in and opened the swallow room. 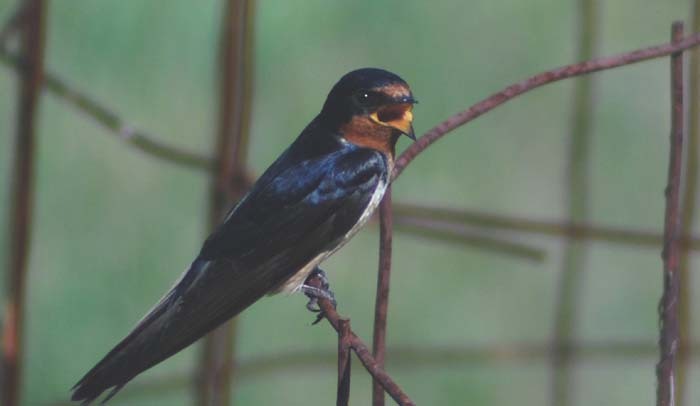 While it appeared that far fewer swallows returned this year, it may be that some birds, finding the colony room closed, simply moved on to their next favorite choice. This would likely be another nearby barn. The reason for the erratic and infrequent incubation at the three nests is unclear. If the nests were deserted, I would think it was a predator scare. However, at least one of the adults returned now and then to incubate, especially in nest 21. Also, the eggs in each of the three early nests were not removed or broken and the fragile mud dam was intact. June 9 – both nests 20 and 21 are being incubated frequently. Several swallows are entering the colony room. June 12 – Both nests 20 (5 eggs) and 21 (2 old eggs) still being incubated. Several swallows in the colony room are bringing mud and grass to nest cups. June 18 – Nest 20 still being incubated, nest 21 appears deserted. One nest cup in colony room has 2 eggs. June 21 – 3 later eggs are hatching in nest No 20. The two earlier eggs in nests 20, 21, and 23 did not hatch, apparently due to lack of adequate incubation. Nest 20 in the shelter fledged three young. Five nests in the colony room fledged all young, totaling only 21 fledglings. The single nest on the wagon shed fledged 3 young. 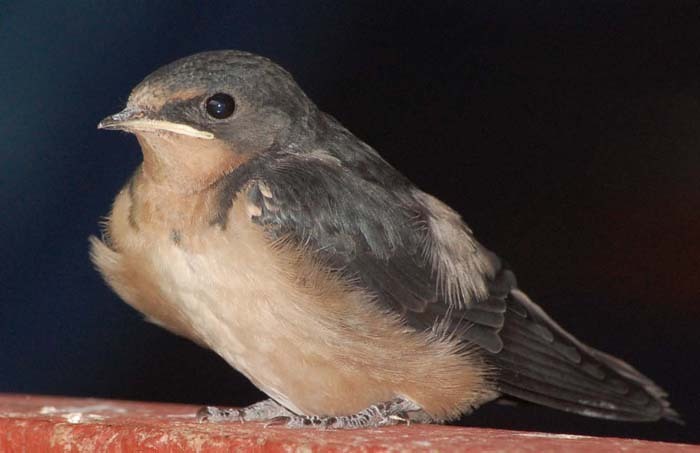 The year total for all swallow nests was a dismal 27 fledglings. Due to the late start, there were no second broods initiated this year. In addition, there was a successful nesting of the two non-target species in the shelter, the phoebes and house finches. 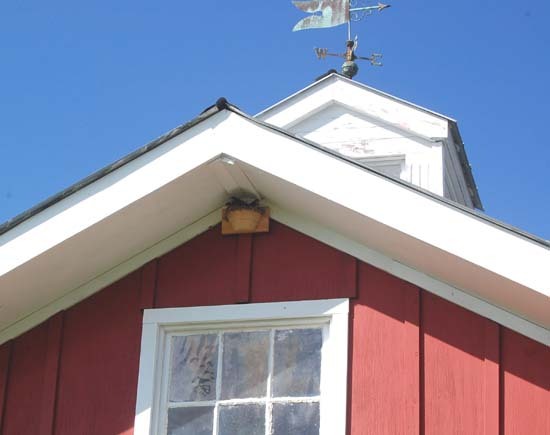 While there are apparently some documented cases of phoebes usurping barn swallow nests, I have never seen this. Phoebes have always nested in the swallow colony room, but have never used a swallow nest. It is likely that at sites where they have taken over a swallow nest, there has been no suitable ledge for them to build their own nest. This year, in the new shelter, a pair used a nest cup for the first time. In this case, there was no horizontal surface on which to build their nest. As for the settlement pattern at a new site in the shelter, there were too few nests to learn much. It was surprising that adjacent nest cups were selected for the 4 finished nests, even though 36 cups were available. Usually, swallows seem to spread out with latecomers filling the spaces in between. One interesting point is that the single successful swallow nesting took place in one of the locations with a cross piece blocking the view of the facing nest cup on the opposite side. Apparently, this rather confining 20” square space is fine with the swallows. Also, all three nest cups in which eggs were laid were new unused cups. Of the 36 nest cups provided in the shelter, 6 had intact old nests from the swallow room, 13 had droppings and mud smears, and 17 were new cups. I don’t think this suggests that unused cups were selected for, but rather that the stage of nest completion wasn't a factor. In the colony room, when it appears that old nests are more frequently reused, it is likely because the same pair is returning to their previously used nest. There was no such prior history at the new shelter. trying to nest there. This shelter was directly in front of the entrance to the swallow colony, so there was much activity as swallows were flying in and out of the colony room and also inspecting the shelter. Several pairs began to claim nest cups and build mud dams in the shelter. One pair had a head start on nesting and this male continually drove off all other males and even females that would land on any other nest cup anywhere in the structure. In an attempt to outwit this male swallow, I quickly attached a room divider of metal roofing across the center of the shelter, effectively creating two rooms. The divider made no difference in the mind of the determined swallow. As soon as I withdrew from the shelter, he began frequently flying around the divider to chase off any male or female landing on a nest cup on either side. And, within minutes, he learned to cling to the edge of the metal divider and twist his body to one side and then the other to view both sides. Throughout the incubation period, this male spent more time guarding both sides of the shelter than he spent foraging or sharing incubation, at least during my periods of observation. By the time the young hatched, this behavior had ceased. 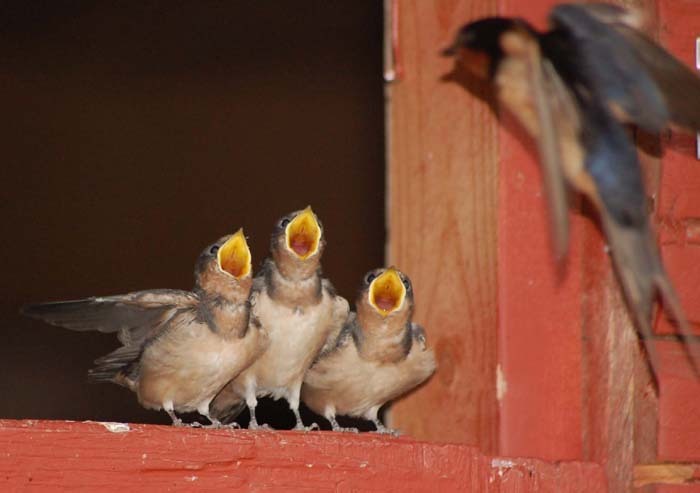 Barn swallows have a complex social life. There may be as much of a hierarchical society in our swallow colony as in a pack of wolves. 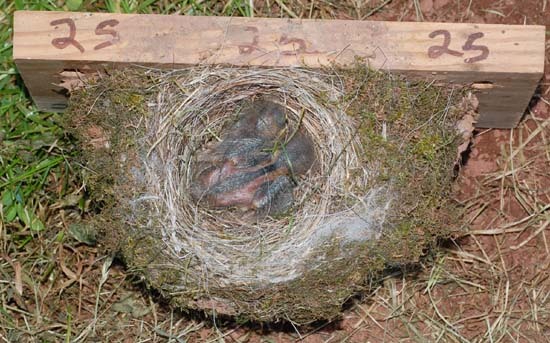 The cause of nesting failures in nest cups 20, 21, and 23 is still unclear. Incubation of the first two eggs in each nest was sporadic, but the nests weren't deserted. And the 3 eggs subsequently laid in nest 20 after a lapse of 5 days between egg 2 and 3 hatched successfully. No predators were observed at the shelter, however the fact that all three nests failed at the same early stage suggests a common cause. Infertile eggs are incubated for the full term before the nest is abandoned. And in this case, egg laying ceased after only two eggs were laid in all three nests. The weather during this period should not have been a factor. It is assumed that the 3 eggs laid in nest 20 beginning five days after the second egg were by the same female. 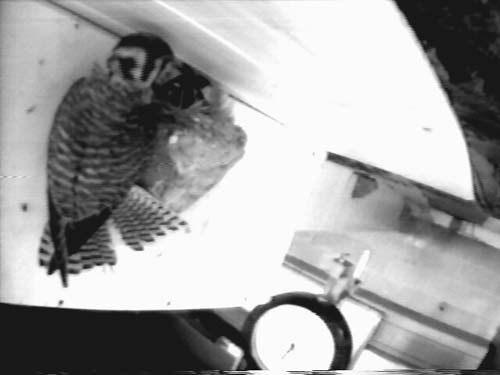 The photo above shows the one example of an American kestrel female fledgling entering the swallow room to prey on barn swallow nestlings. This event, in 2001, was never repeated. 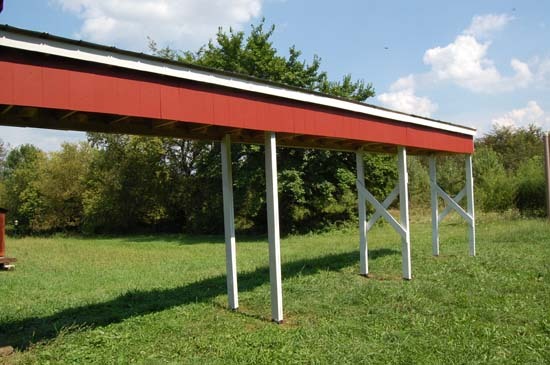 However, the more open swallow shelter offers less security and a second pair of kestrels nested around the corner of the barn from the shelter again this year. This pair often perch in the ugly young maple in front of their nest box and are seldom mobbed by songbirds. The barn swallows show even less interest in them and seldom give chase. 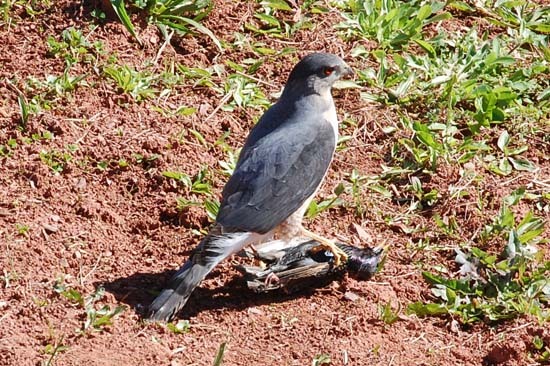 Another, more likely, culprit is the Cooper's hawk. Last week, December 19, a coopers hawk was observed attacking the holding cage of a starling trap in an attempt to reach the trapped starling. A pair of Coopers hawks were seen perched in adjacent trees last March down by the creek, but none were observed during the swallow nesting season. However, in previous years, a Coopers hawk was often seen at sunset flying in to the small grove of white pines that I planted as 6" seedlings to grow a cool summer office. Now the summer office is over 40 feet tall and has attracted both grackles and the Coopers hawk. I have had little trouble discouraging the grackles from adopting one of the pines as a group nesting tree by simply walking out into the grove in the evening when they come in to roost. There was no need to flail about or shout obscenities at them - my mere presence drove them off. Actually, I have great admiration for the grackles, but a large number of them nesting in the pines would not be compatible with the songbirds who also nest there. 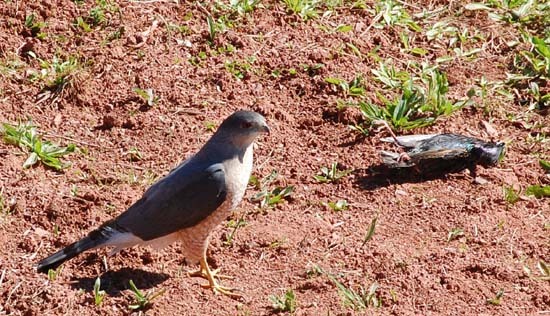 In 2012, I had inadvertently trained a Coopers hawk to take the starlings I had removed from traps. Earlier, I had been laying the dead birds out at the edge of the garden for a fox that had come each evening to recycle them. But, once, when I tossed a dead starling out a 3rd floor barn window, a Coopers came out of nowhere and pounced on it. After that, the starlings were disappearing long before the fox made her rounds, sometimes just minutes after I had put them out. 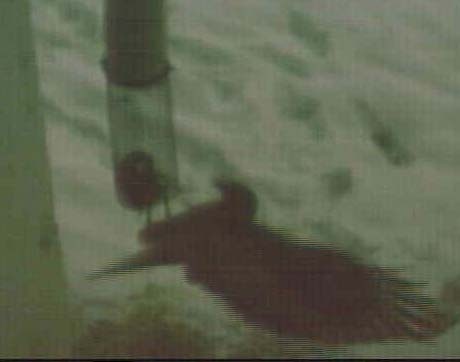 I liked the idea of feeding the Coopers because every dead starling probably saved the life of one songbird that day. But, I began to take the starlings far away from the yard to offer to whomever found them. The starlings usually disappeared by the next day, but I don't know that the Coopers hawk ever found them at the new location down by the creek. The third potential predator that may have frightened the swallows this spring is the black rat snake, although my money is still on the Coopers hawk. 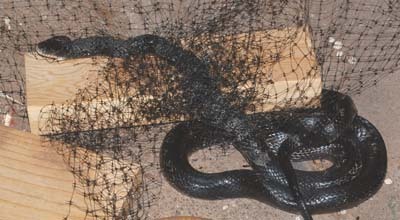 Black rat snakes are often reported predating bluebird nests and even purple martin housing. However, a snake has never been implicated in any nest box predation on our property. The species that has most often been the little offender is the beloved house wren. Bird netting was hung over one of the large barn doors on the second floor as well as the large shop door on the first floor last summer to keep out swallows and other birds. The doors are kept open during the day to prevent the barn from overheating the nesting owls and the human making nest cups. Birds entering any open door or window on the second floor often have difficulty finding their way out. 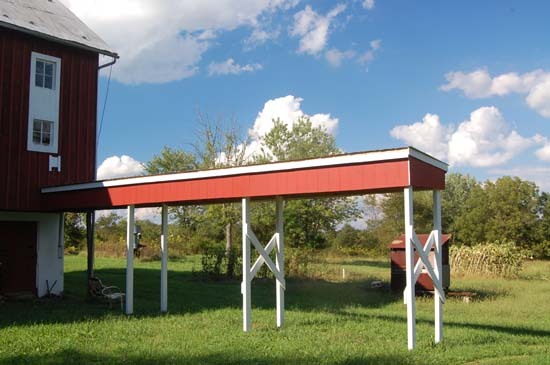 The reason seems to be that they instinctively fly toward the sky, and, in the barn, that means flying toward the top windows, which are closed or screened. From high in the barn, they are looking down at the large door openings and see only ground. Many species, from catbirds to barn swallows, have become trapped in the barn, continually flying from one end to the other, too high to see skylight through the open doors. The bird netting was hung loosely from the top of one of the 19' x 12' doors and tied to a length of pvc pipe at the bottom so it could be raised to allow entry for the tractor. This worked well to exclude all birds, but the loose netting at the bottom entrapped a large black rat snake. 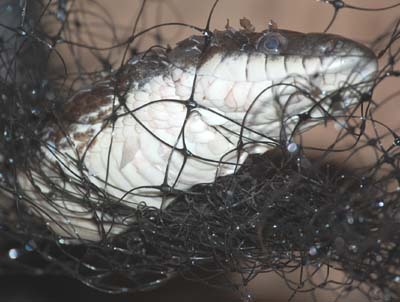 It took 20 minutes to carefully remove the netting from the snake, even after cutting out the tangle with scissors. Apparently, the snake had repeatedly rolled its body in the same direction, winding the loose netting in ever tightening knots. The netting was 3/4" mesh. I will try to find 1/4" mesh for next year. 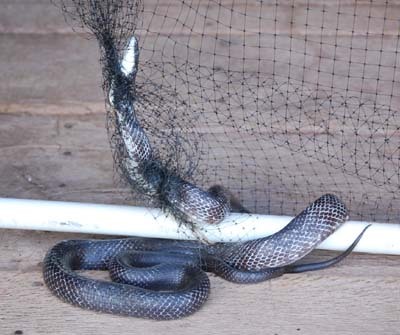 A week later a second, much smaller black rat snake was entrapped in the netting on the shop door, requiring a similarly laborious extrication. Snakes are a valuable asset in the home habitat. When released, the large rat snake immediately went down the hill to the wagon shed. The previous year I had hung a couple hundred sunflower heads from the shed rafters to dry, which attracted white footed mice. A barn owl began perching on a joist in the shed, leaving behind its telltale pellets. I imagine the snake also found the wagon shed a bountiful hunting ground. The barn colony room door was left open this year and 9 pairs nested in the colony room. 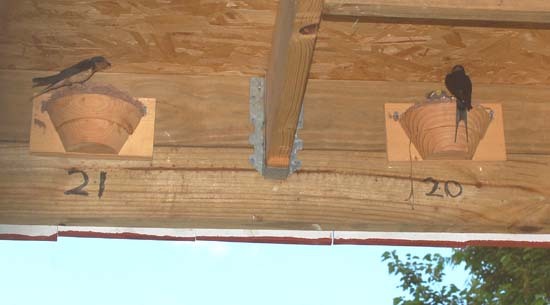 One pair used last year's nest cup under the peak of the wagon shed and one pair built a mud nest under the barn overhang directly in front of the colony room entrance. For the second brood, the wagon shed pair moved to the swallow room. No swallows used the adjacent shelter, as expected. 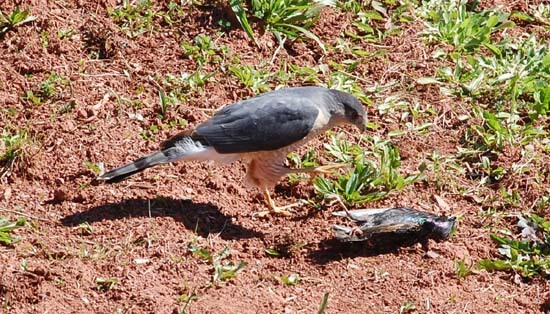 Of the 11 pairs, each having two broods, only 2 eggs failed to hatch and only one nestling was found dead on the floor. This is actually exceptional for a total of 22 nestings. The only problem is why there are so few pairs again this year. The only mishap this year was the natural mud nest under the overhang falling. I had noticed the adults continually feeding older nestlings in the mud nest while I was photographing fledglings directly below the nest on the Dutch door entrance to the colony room. The nestlings were within 2 or 3 days of fledging, so I didn't approach the nest. Three days later, I discovered the fallen mud nest, but no premature fledglings were found, so it's likely they successfully fledged before or when the nest fell. Now a nestcup is in place where the mud nest had been. 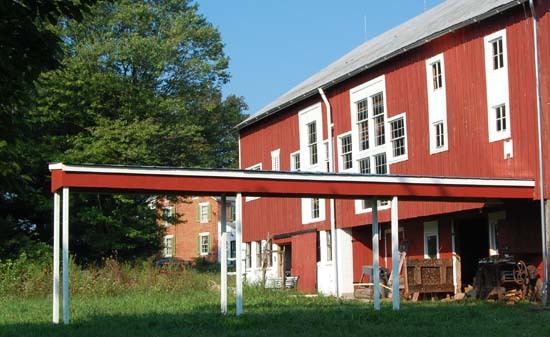 © 2013, 2014 American Artifacts and Richard Van Vleck, Taneytown, Maryland.